Every time I think of rabbit I can’t help but think about Elmer Fudd and “dag nabbit silly rabbit!” Poor old Elmer. He never would catch Bugs Bunny; a good thing, too, because we never would have seen Bugs anymore. Bugs was always too crafty for poor blundering Elmer. Fortunately, this rabbit wasn’t too crafty because we had it for dinner and it was delicious. Rabbits are cute little critters, aren’t they? Those lovable long ears, wiggly little nose and fluffy cotton tail simply endear them to us. So much so that we Americans have a fixation on the cuteness of bunny rabbits. They appear in movies, i.e. Harvey, the Pooka. They are lovable cartoon characters, i.e. Bugs Bunny. They are part of the Easter Celebration with the Easter Bunny and they are pets for our children. There simply is no limit to the cuteness of the rabbit. This probably explains why you don’t see rabbit as a regular food source in the American diet, unlike European cuisine where rabbit is a mainstay. That’s too bad, too because rabbit is a lean protein that’s low in cholesterol. In fact, it may also just be the most nutritious meat there is. Because it is lean, it has more protein and fewer calories. Like grass-fed beef, it also has very high levels of omega-3’s and other good fats. Given rabbits multiply like rabbits, it’s also a sustainable meat source. 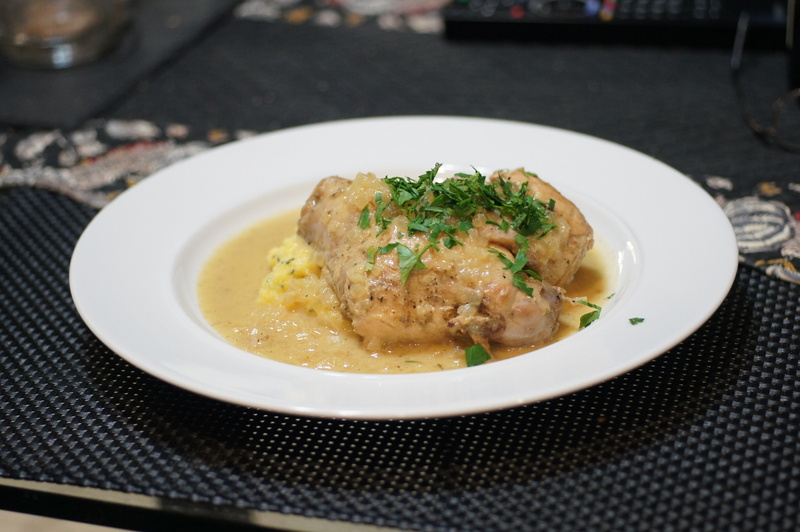 As for its taste, rabbit tastes very much like poultry or veal so it is very versatile. When it comes to food, I’m not that squeamish and the cuteness factor simply doesn’t enter into the equation. Rabbit is good food and good for you. 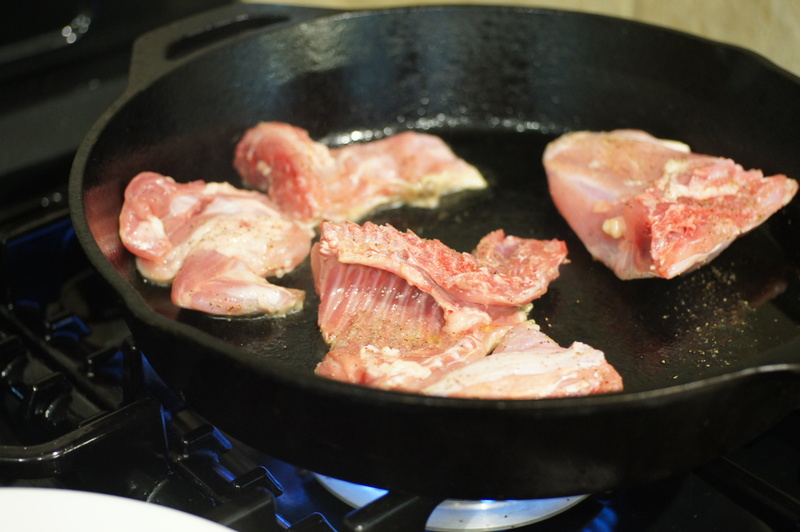 You owe it to yourself to try rabbit as a meat source. You will be surprised at the juicy, tender flesh and its nice delicate flavor. Try this recipe and let us know if rabbit is for you. Pat rabbit pieces dry and season with salt and pepper. 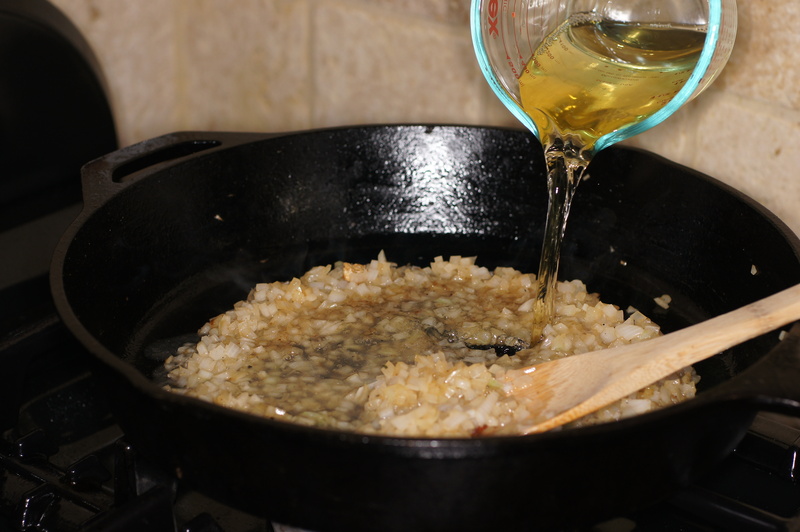 In a deep large heavy skillet heat oil over moderate heat until hot but not smoking. Brown rabbit pieces on all sides in 2 batches. Transfer rabbit as browned to a large bowl. 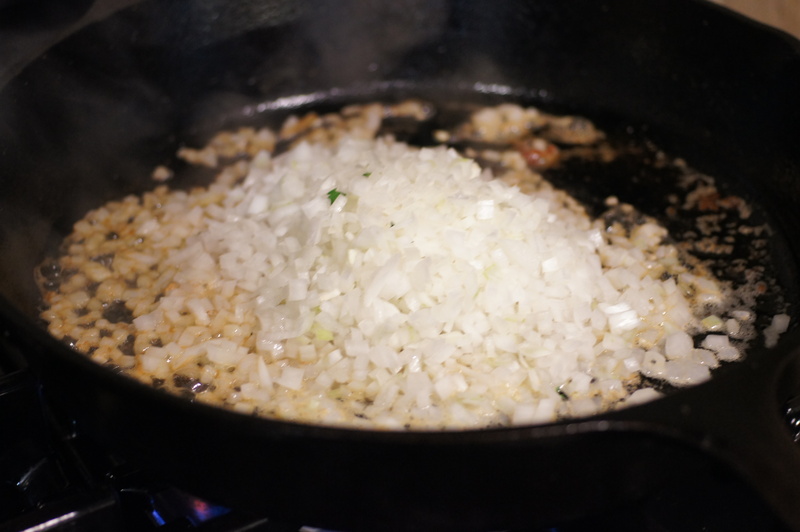 Add 1 tablespoon butter to skillet then add onions to skillet and sweat until softened, roughly 2 – 3 minutes. Add wine and boil until liquid is reduced by about half. 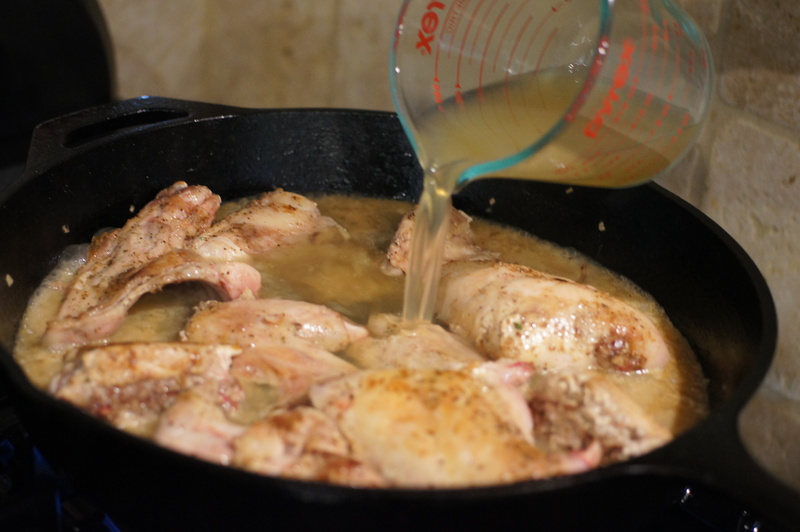 Return rabbit to skillet and add broth. Simmer rabbit, covered, until tender, roughly 40 minutes. Transfer rabbit to cleaned large bowl and boil sauce until reduced to about 2 cups. In a small bowl whisk together 1/4 cup sauce and mustard and whisk mixture into sauce. 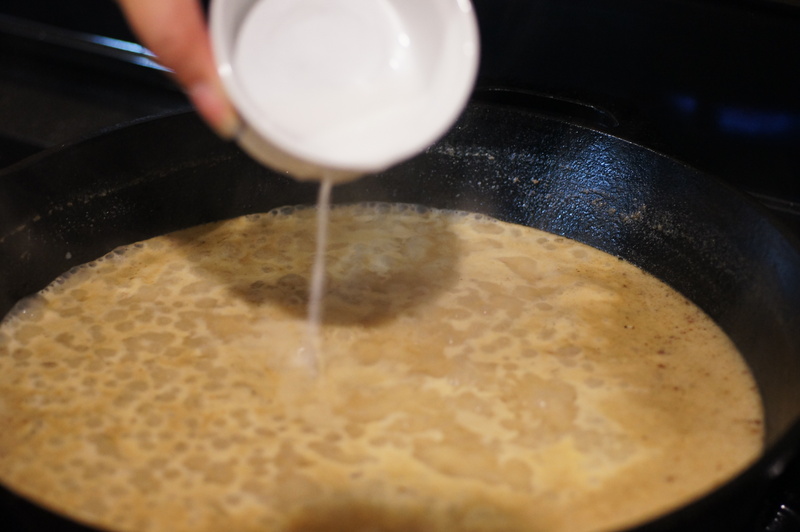 In another small bowl stir cornstarch into 1 tablespoon cold water and whisk into sauce. Simmer sauce, whisking, 3 minutes, or until thickened. Whisk in remaining tablespoon butter, and salt and pepper to taste. Return rabbit to skillet and cook over moderately low heat, turning rabbit to coat with sauce, until heated through. When done, place a scoop of polenta in the middle of a plate. Place rabbit on top and garnish with the chopped parsley. Serve and enjoy. A very delicious sounding dish. You are right…I think the cuteness factor keeps many Americans from enjoying it. 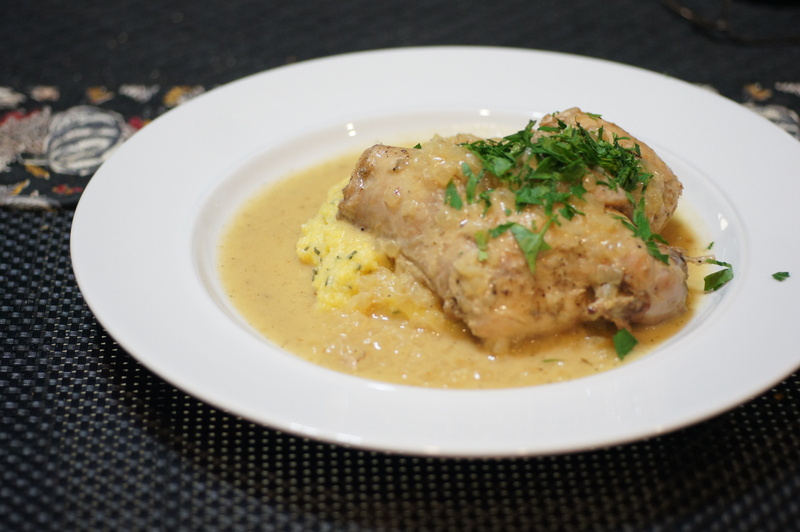 My family has always enjoyed rabbit, although we braise it differently than you do. Now that I’ve learned to prepare, I often serve it atop polenta, too. Still, this mustard sauce of yours sounds delicious, Richard, and as a polenta lover, that opening photo is singing to me. I need to give your recipe a try. Thanks for sharing. Thanks, John, for your nice compliment. I’d like to see how you braise it. Do you have a post with rabbit? I used to have a rabbit as a pet when I was a kid, and never wanted to eat rabbit because of that. But now I agree with you that cuteness doesn’t have anything to do with a decision to eat something — I also eat ‘Bambi’ and don’t mind thrusting a knife through a lobster’s brain. I agree with you that rabbit is great meat, and I’ve gotten to know it mostly in southern European countries since also here in NL it’s not generally availabe because of the cuteness. At first I had some difficulty preparing rabbit myself, since it was often dry and/or tough. But with sous-vide, it is a breeze! I should try it with your sauce! Thanks, Stefan. I always appreciate your comments. I have thought about doing it sous vide but haven’t gotten around to it as of yet. What temp do you sous vide your rabbit and for how long? Thanks. I am going to give it a try next time I get some rabbit. I think you can use the met juices from the bag to mix with the other ingredients to make the mustard sauce. Thanks for dropping by and your nice comment. I would love to find wild rabbit but the only ones we have here in the DFW area are little cotton tails that wouldn’t have much meat or jack rabbits that would be extraordinarily tough. People, however, are beginning to farm them so I might start looking for farmed rabbit in the area. Generally, I find frozen rabbit at the asian markets in town.